Lately, all the desserts that I've been making seem to be frozen ones: they're super easy, super delicious, super perfect for the hot weather, and they disappear super quickly from my freezer. 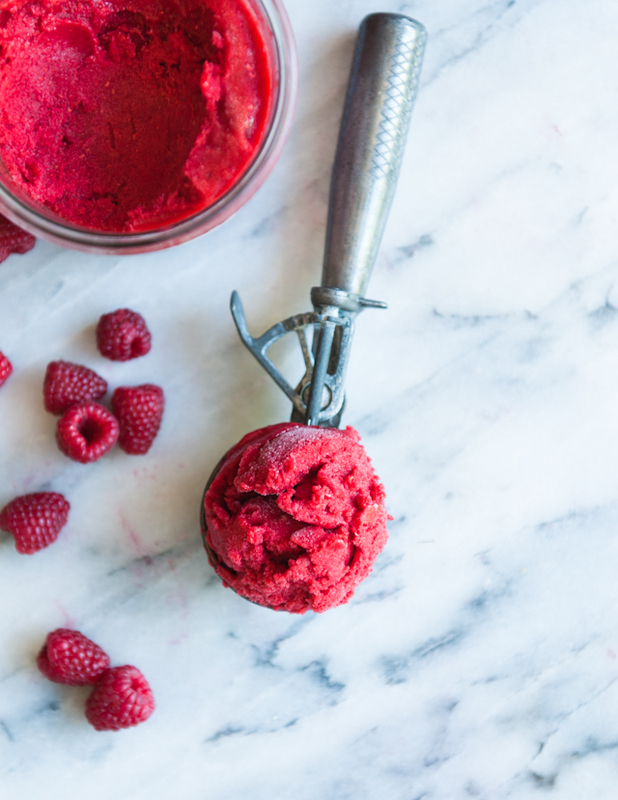 This raspberry sorbet is the latest concoction out of the ice cream maker, and it's so thick and dense and packed with raspberries that it tastes almost creamy--even though there's no dairy in it. (Also, I looooove how deeply pink-red it is.) Then, as an extra treat, I've been pouring some of my favorite extra spicy ginger beer (a nonalcoholic and stronger version of ginger ale) on top to make a fruitier version of the classic root beer float: the raspberry sorbet and ginger beer float, which is so perfectly refreshing. P.S. I'll be passing through Boulder, CO and Kansas City over the next few days. 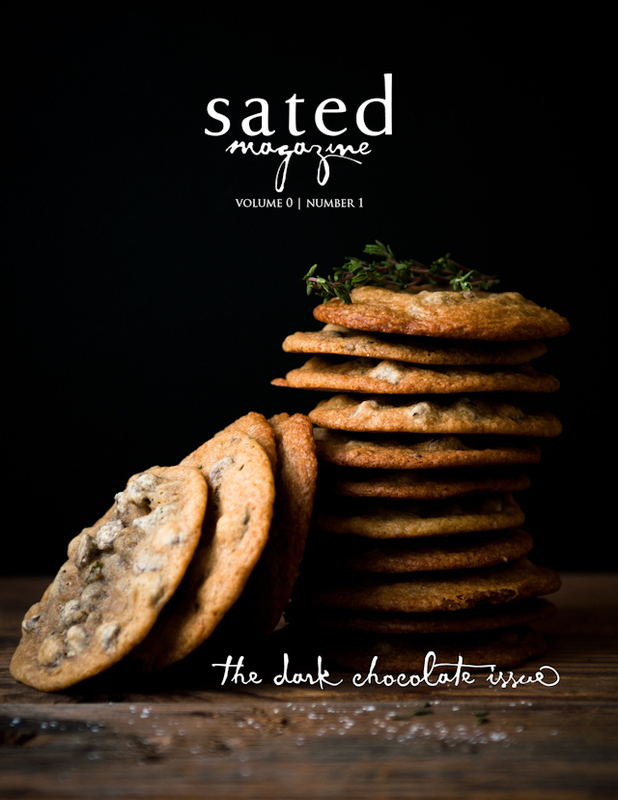 Do you all have any suggestions for absolutely-do-not-miss restaurants and foodie hangouts??? 1. Combine the raspberries and water in a food processor. Pulse until smooth. If desired, strain and discard the seeds using a fine mesh sieve. Return the raspberry puree to the food processor bowl. 2. Add the sugar, tapioca starch, and lemon juice, pulsing to combine thoroughly until the sugar has dissolved. 3. Chill the mixture thoroughly. 4. Freeze according to your ice cream makers’ instructions. Remove the sorbet from the ice cream maker when it is mostly frozen but still soft and continue to let harden in the freezer until solid. 5. Serve with ginger beer. OMG i love your recipe love your shots...me too in my new post i used a gif!!! Mmm yes please! This sounds awesome. Love the animation at the beginning! Have you seen Not So Humble Pie's Raspberry Ginger Ice Cream Float (http://tinyurl.com/ykjxdly)? It's similar to what you've got, but if you've got any leftover raspberries, it might be right up your alley! oh i love this, especially colorwise! ginger beer is hard to find in germany, though. Gorgeous gif! 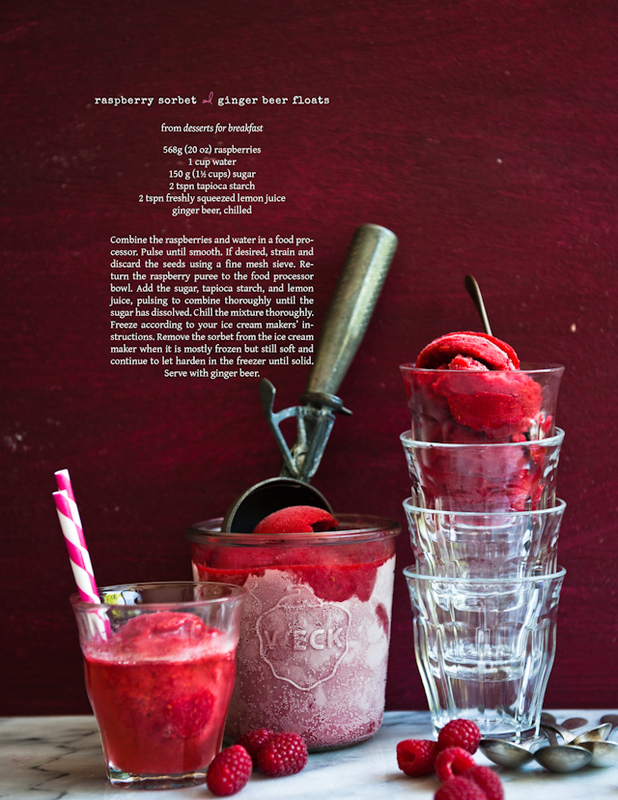 I adore ginger beer but would never have thought to pair it with raspberry sorbet. Just delicious. Just found your blog...beautiful. And this recipe, well, I think I can handle coming back a few times. Beautiful, as always. Love the .gif at the top and the other images too. The addition of ginger beer is fantastic. Gorgeous! 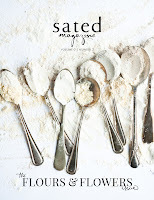 On a side note, I am totally obsessed with Weck jars. That looks lovely <3 I might have to try and make that myself even though I'm more of an ice cream girl rather than sorbet! But the ginger beer sounds like a delicious summer combo! Stephanie, so much to say to you!! I LOVE that first photo. How do you do that? It is fabulous. If you ever have time, I would love to know to create a photo with movement like that. 1. the Saturday market on the river. The entire area is closed off. The market takes up a large center parking lot and tiny little ethnic restaurants and mom and pop shops surround the market. It's a lively, multi-cultural area of KC that we loved to go to. 3. The new "Power and Light" district was just being completed when we moved. This area is right off of Union Station and in the "downtown" area of KC (but the entire city is not that big). This is the hot spot for 20 somethings, bars, lights, concerts, sporting venues, comedy clubs, etc. It is trendy, contemporary and sleek. A fun place to be when it is all lit up at night. oh my, looking SO good!! You are awesomly clever I love the moving pic. So fantastic. the sorbet is delicious looking and someonnnne commented on the jar....... I dont know Wreck but it they look like some I want! Man, that is some seriously inspiring photography work. Yum! I've only had my ice cream maker for this summer, and I'm excited to try a sorbet. This looks like a fantastic one! Yum...that looks so refreshing! Hope you don't mind, but I reblogged this gem on my blog www.fiftyfivesf.com. On behalf of the City of SF, we thank you! That gif is sooooo beautiful. There is nothing I love more than raspberry sorbet. Bet it would be delicious with lambic instead of ginger beer!